Air dry clay: any brand in your local stores or home made one. For this project I used Cold Porcelain Clay. Silver beads and pin for hair accessories. Prepare your clay with sizes like the above picture. I used basic color white and red clay. Mix a little bit of red with white to get the pale pink skin color, and then add more red for pink kimono. I used brown color for the hair. If you don't have brown color, mix red, yellow and black color clay. Start by preparing 4 ball shape clay: 1 big one for head, 2 smaller ones for ears and 1 very small ball shape for the nose. Use your baby finger to press the middle of big ball shape for eyes lightly and let your finger go around the side of the ball. Press the 2 smaller balls for ears and press one side of it on the table. Attach the ears and nose to the head with white glue and insert the toothpick at he bottom and let it dry. 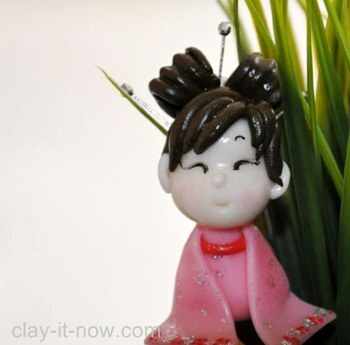 When the clay dry, use your black marker to draw the eyes with eyelashes at the corner and the eyebrows. 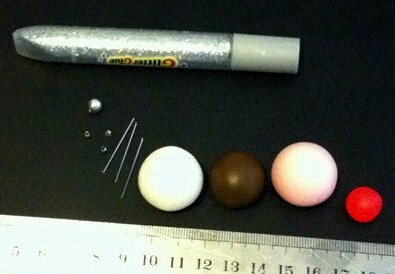 Prepare 1 ball shape, 3 small cylinder shapes and few short spaghetti strand for fringe in brown color. Flatten the ball and cylinder shape to about 3 millimeters and make some line on it. 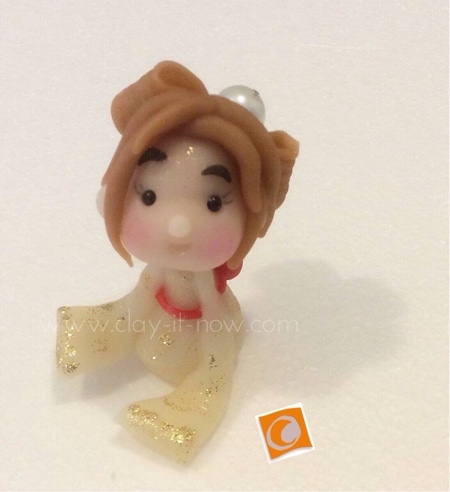 Use glue to attach the hair to the head as shown in the picture and then insert the hair accessories. Roll your pink clay to an egg shape, sharpen one of the point and press the other end and flatten it to form the legs. Roll your red clay to small pipe and cube and attach it to the upper body to form the Obi. Use your rolling pin to flatten the pink clay to about 3 millimeters, cut two triangle shapes for the sleeves and let them dry. Take your red marker and silver glitter glue to draw 4 petals flowers or just make some dots at the edges of the sleeves. Attach the sleeves to the body/ kimono with white glue. When the body completely dry, insert the toothpick that hold the head to the body. And, your Japanese girl figurine is done!